I'm going to Louisville again! Managed to get VIP after 20 tense minutes of refreshing, so I guess someone was holding them and timed out. 2nd row, exactly in the middle. At least, I sure hope I got it, the website was dying- it errored the first time I tried to checkout (so much panic) went through the second time, but I'm still half paranoid that it's not actually real, even though I have the confirmation email and my credit card is a bit lighter. Just a long time to wait now. I was reading about this yesterday and got an automated phone call about it today. What a mess! I hope they're able to get the Center cleaned up and back in order soon, it was a nice theater when we were there for TATINOF, but it sounds like there's still a lot to be done and they don't even have an estimated date yet. I'm a bit bummed about it being in an amphitheater, because ew, outside. But I'll definitely take it over being cancelled. Waiting to see where my "comparable" tickets are going to be. It looks like the first row is one seat shorter, and the second row is two seats shorter, and gets worse from there by several each row, so some people may get shifted back. Good thing it wasn't sold out I guess? Also I'm glad I procrastinated on getting a hotel room. This date is/would be my second show and I’d be coming from out of town as well. If Louisville is like some other parts of the south it might get pretty sticky sitting out there in that audience (not to mention for the guys on stage! )...and do not forget to pack bug spray. I’ll admit, the other theatre location gave me the confidence of both being in a comfortable (AC’ed!) space for the show even if it ends up being super humid out and accessibility (the amphitheater seems to be in a more isolated area on the outskirts of the city vs. downtown)...but it might be neat to see them in a different type of venue (since it looks like they’re only doing two other shows outdoors). Did you find out about your new seats yet? I called in this afternoon and they have me in pretty much the same exact place, so hopefully yours work out too! Hello! I'm not actually from Louisville either, but it's the only show I have tickets for. I was reeeeally tempted to go for Nashville as well, but with it being the next night I thought it might be a bit much. Kinda regret it though. I finally got my new tickets today, and mine are in pretty much the exact same place as well. Which logically I figured, but for some reason I was anxious about it anyway, so glad that's set. The amphitheater is farther from downtown, but it's at least near the airport, so there are hotels and (more importantly) restaurants in the general area because of that, although I'm not sure what you had in mind to check out. I've been to Louisville a few times, but mostly short visits like this one, so not sure how much help I'd be with advice on what to see. If you do drive downtown, be warned that it's much easier to get in than it is to find your way out. The interstate entrances are a bit hidden! Just had my M&G! Just watching them now. Still weird seeing them in person. Last edited by lefthandedism on Thu Aug 02, 2018 11:46 pm, edited 1 time in total. Just got back - had a lot of fun of course. Nothing too unexpected because I like spoilers, but I definitely grinned for two solid hours. The mom who asked me if I was there with my daughter, who I replied to with I AM the daughter. (Aka how to tell you’re too old for this.) She also won the parent award with her very staged photo, so congrats. The lazy moth that just wanted to lay at Dan’s feet. Same. I don’t know if I have anything actually coherent to say about the show - def more low key than tatinof in a good way. The audience is very predictable and they know how to play it well. And it’s cute seeing Phil’s little jump when he wins something no matter how often he’s done it. It was also amusing how he very much never ever looked at the people in front of him, always either above us or down or sideways. They didn’t have the hexagon, I guess due to lack of space, but I don’t know that anything was lost but a bit of style. Also my M&G pic is the least ugly photo of myself ever taken so Dan is magic. And Phil’s eyes are lovely. Phil is lovely, they’re both lovely, oops I’m grinning again. Thanks for your review, apathy, and glad you had a good time and a nice M&G with the boys! I did end up going as well and very much enjoyed my time in Louisville (and got some goooood southern eats in) and, of course, the show. 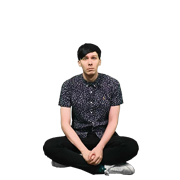 -	First of all…as apathy mentioned…Phil had his bloody calves and a slither of his thigh (!!!) out for the lads...you know, from where I was sitting (about 12 rows back and way off to the side), I wasn’t sure if that really was…ahem, a bit of thigh on display but, er, thanks for confirming Seriously y’all don’t even know...and I was surprised that he did a kneel for the song at the end anyway we appreciate you so much bby. -	Being in daylight for the first half of the show was an experience let me tell you. It definitely made giving the naughty answers in the sim seem just that extra bit naughtier. Phil played off the sun setting by the beginning of Act Two by going like" the sun has set..." in a sinister voice. -	I actually liked the parent award this time around, I think because this audience had more of a TATINOF 2.0 vibe. No shade just apples and oranges. I’m sure every audience is at least somewhat unique (and they have no way of predicting) so it makes sense that what didn’t work as well at one show would work a lot better at another. -	I think Phil was genuinely a bit terrified of the death pit of death at the front of the stage though...especially after his recent dream! -	Phil quirked his eyebrows at the audience right before he put the cap and glasses on for the rap. He also did this very Christian Slater-like gesture toward the beginning (I think during Truth Bombs), which was just…nice. And he pushed his glasses up from the center at the beginning of the survey section It’s these little gestures...he says he’s clumsy but he moves quite gracefully when he does them. -	Less localization this time (though they made a few comments about fried food and farms and when people started cheering for satan Dan was like “in KENTUCKY???? ?” which was hilarious)…but they more than made up for it with their little ad lib moth fear moments. -	I’m sorry I’m talking so much about Phil, I watched Dan a lot more last time so I shifted my focus to Phil this time and ended up noticing a lot more from him as a result. I did listen more to Dan’s piano playing though and he seems to have grown in it a bit playing live every night and he kept me giggling with his moth issues. -	….a few points when they tried to go with bits from previous shows but maybe were a bit out of sync. Like when they were doing the friendship test zaps, Phil kinda just reacted generically like "owww" but Dan was like “what is it? You feel tingly? Like it feels nice?” to kind of coax him into the whole “enjoying it too much?” thing maybe? It’s not a criticism as much as something that got me thinking about how they work things out behind the scenes…do they plan out all of the directions they’re going to go before each show? Or do they go where the wind takes them and rely on the other to keep them on task? Something in the middle? How does it change from show to show? It must be hard to remember exactly what’s said and done earlier during every performance and the lines must get crossed sometimes (Dan teasingly asked Phil to remember our audience name in the second act and he didn’t miss a beat…we were “Mary” of course!). Overall, had a lovely time, our outdoor audience lucked out and got a pleasant evening (no rain and not too humid), and now I’m a bit melancholy that it’s all over…but look forward to hearing how the rest of the tour – and everyone else’s experiences – go in the remaining weeks (and everyone's reactions to the recording once it's released, whether you're able to see it live or not )! Hey, glad you ended up going too! We actually ate at a Vietnamese restaurant there for the first time, southern food is pretty common to me. Nice to read your thoughts, you picked up a few things I didn't catch as much, especially since I hadn't seen the whole thing before. Dan pulling Phil back with the crab walk thing was great! And his laugh with it. I had no idea if they'd done that at other shows. The comment with the apron... I mean, you couldn't really see his shorts under it, so it was A Look. It was definitely a sliver of thigh - I accidentally got a shot of it from the M&G as well, he was wearing the same shorts. You could actually see half his pocket inside through the slit. It was kind of hypnotizing... and probably not in the way that other people might find it (I'm still ridiculously ace) but more in the sense of, WOW, here's Phil in 2018 with the confidence to walk out on a stage and own it. For a guy who seemed to feel awkward about any jean rips at all less than a year ago, that's a huge turnaround. I definitely agree with you that Phil was gorgeous and I was probably creepily staring at him most of the time. He somehow looks a lot more intense, for lack of a better word, in person. I'm not sure how I would've coped if the death pit hadn't been there to keep me farther away.